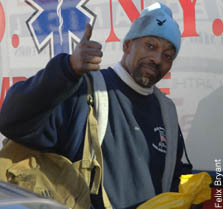 NEW YORK --Wesley Autrey probably has enough new nicknames to fill a top 10 list: "subway superman," "hero of Harlem" and "subway savior," to name a few. Whatever the number, Autrey's dramatic move to rescue a young man from Massachusetts in a subway track earned him a spot on David Letterman's "Late Show," capping a day spent basking in his newfound celebrity. But Autrey has said since the rescue Tuesday that he doesn't consider himself a hero, and he told Letterman's audience it was just "something that all New Yorkers should do." "How are you going to walk by someone who's ill and just look -- 'Oh, well, I'm busy, I've got to go to work'?" Autrey said in an interview broadcast Thursday night. It was part of a day in which the 50-year-old Harlem construction worker was showered with a trip to Disney World, $10,000 from Donald Trump, a medal from the mayor and plenty of national attention. In a statement, the family of the rescued man, Cameron Hollopeter, 19, of Littleton, Mass., said Autrey "deserves all of the attention and the accolades that are now being bestowed upon him." Accompanied by his daughters, 6-year-old Shuqui and 4-year-old Syshe, Autrey smiled broadly as he was lauded during an appearance with Mayor Michael Bloomberg and other city leaders. Bloomberg called Autrey "the hero of Harlem" and presented him with a Bronze Medallion, the city's highest award for civic achievement. Past honorees have included Gen. Douglas MacArthur, Martin Luther King Jr., Muhammad Ali and Willie Mays. The last recipient was Housing Authority employee Felix Vasquez, who caught a baby thrown from a burning building in 2005. Autrey is "a man who makes us all proud to be New Yorkers," said the mayor. After giving the mayor thanks and a bear hug, Autrey recounted the details of the risky rescue for the media gathered at City Hall. Hollopeter, a student at the New York Film Academy, was at the subway station at 137th Street/City College when he suffered a seizure and fell onto the tracks just as a train was approaching. Autrey was standing on the platform with his daughters and scores of other subway riders when he saw Hollopeter convulsing on the tracks. As he watched, he thought: "I'm the only one to do it." He eyed the trough between the rails before jumping on top of the teenager, Autrey said, and relied on his experience as a construction worker used to "confined spaces" to calculate -- in split seconds -- that "maybe we have enough clearance." Before jumping, he said he made sure his daughters were OK and asked two women to hold their hands. The southbound train grazed the top of his hat. He said he and Hollopeter remained there for 20 minutes while transit workers shut off the third rail. Hollopeter was hospitalized in stable condition Thursday. Autrey refused medical attention after the rescue -- and then went to work. He said his boss bought him a "hero" sandwich. Autrey wasn't alone in his heroics: On Wednesday, three police officers delivered a baby on a Brooklyn subway platform. And on Thursday, two men passing by a Bronx apartment building caught a 3-year-old boy who toppled from a fourth-floor fire escape, police said. Both children were in good condition. "This is the week of heroes in New York," said Police Commissioner Raymond Kelly. After the City Hall ceremony, a limousine whisked Autrey -- who also received a year's worth of free subway rides -- to a meeting with Trump, who presented him $10,000. "This is a brave man," Trump said at a news conference. Autrey also has received $2,500 from the New York Film Academy to start a scholarship fund for his children, and he has been given tickets and a backstage tour to the Broadway musical "The Lion King." He did the morning news show circuit on Thursday and is to be flown to Los Angeles for an appearance next week on Ellen DeGeneres' show. Autrey said the best thing about the City Hall ceremony was "being able to be with my daughters here because the situation could have turned out a lot worse." Born in Florida, he attributed his urge to help others to his "Southern upbringing." As for his new celebrity, he concluded, "Good things happen when you do good."